After the success of Golden Voyage, Columbia Pictures and Ray Harryhausen decided to up their game by shooting the third Sinbad movie at eye-popping locations in Spain, Malta, and Jordan, including the actual ruins of Petra. Then I guess they figured no further improvements were needed, because they hired mediocre director Sam Wanamaker, a journeyman unable to mitigate the pacing problems of the story, which was already burdened by a dull and generic script by Beverly Cross. The cast is bland as well, featuring the charisma-free Patrick Wayne (son of John) as Sinbad, and the vacant Taryn Power (daughter of Tyrone) as Dione, the wizard’s telepathic daughter. Jane Seymour as Princess Farah gets to do some decent acting in a couple of early scenes, but then the movie forgets she has any character and demotes her to the role of not-much-clothes horse. The best actors, as usual, are cast as the magicians, Margaret Whiting as the transforming sorceress Zenobia, and Patrick Troughton (the Second Doctor) as Melanthius, gray and looking just like Gandalf minus the hat. The film’s saving grace, as always, is the stop-motion artistry of Harryhausen and his wonderful creatures. The plot follows the tried-and-true quest structure, with Sinbad and company on a perilous journey to find a cure for Farah’s brother, Prince Kassim, whom Zenobia has transformed into a baboon. This animated primate, with its humanlike gestures and expressions, is entirely convincing, and ranks with Harryhausen’s best work. Zenobia also gets a first-rate animated companion in Minaton, a bronze minotaur golem with a clockwork heart and an endless reservoir of superhuman strength. 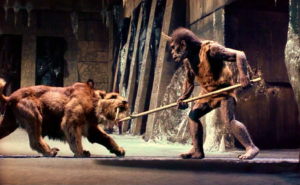 With the baboon in almost every scene with Sinbad, and Minaton ever-present with Zenobia, Eye of the Tiger probably features more onscreen creature-time than any other Harryhausen epic. The journey is the usual parade of wonders interrupted by fantasy mêlées. It’s a tribute to Harryhausen’s skill—and an indictment of Wanamaker’s failings—that the animated combats are far better choreographed than the live-action fights. In the middle of the film, as Sinbad’s ship sails toward arctic Hyperborea, pursued by Zenobia in a bronze boat powered by the untiring Minaton, the pacing sags in a miasma of fog, stock footage of icebergs, and a dumb battle with a giant walrus, possibly the least-cool Harryhausen creation ever. The pace picks up again when they reach Hyperborea, where Sinbad and friends encounter an over-sized pre-human they call Trog. Instead of the expected combat pitting Trog and his great bone club against the scimitars of Sinbad’s crew, Kassim the baboon befriends the primitive creature, and it trustingly joins their party. The friendly nonverbal interactions between Trog and the baboon that follow are delightful, and the animated creatures establish an emotional connection stronger than any between the movie’s “real” actors. As usual, the climactic scene is set in an ancient temple, an Arctic pyramid with a magic ever-swirling Jacuzzi inside. This confrontation between good and evil is overlong and entirely predictable, and some fine monster-wrestling notwithstanding, you just wish they’d hurry up and get it over with. The wrestling comes courtesy of an ice-locked saber-toothed tiger, which in accordance with the ironclad Law of Frozen Prehistoric Beasts gets thawed out to menace the heroes. Once the final fight is over the film blessedly cuts straight to the end credits, which play over the coronation of the rehumanized Prince Kassim, while the rest of the good guys smile in bland approval. That’s fine: we don’t really need any character closure with them anyway, since none of them have half the heart and soul of Harryhausen’s noble beasts. This is a stark, brutal, black-and-white adaptation of Macbeth that relocates the story from medieval Scotland to samurai Japan, replacing Shakespeare’s sonorous language with the stylized imagery of classical Noh theater—so, yeah, it’s not a movie for everybody. It’s a fast ride to Hell on the horses of greed, ambition, and betrayal, with few (if any) sympathetic characters, shorn of even the lukewarm reassurance found in Shakespeare’s moralistic finale. Bummer. 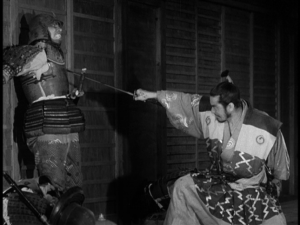 But if you can get past, or even embrace all that, you’ll find that director Kurosawa’s third samurai film is rich with vivid scenes you’ll never forget. The encounter in the haunted forest between Generals Washizu (Toshiro Mifune) and Miki (Akira Kubo) with the pale and malevolent witch who foretells their fates. The brooding intensity of the murder scene in which Washizu’s wife, Lady Asaji (Isuzu Yamada), hands him the spear with which he is to assassinate their guest, his reigning lord, and her tense wait for him to return, shaken, his hands clotted with blood. The siege of the great black castle on the barren slopes of Mt. Fuji where Washizu, now the reigning lord himself, pays the price for his betrayals in a hissing storm of hurtling arrows. Most of all, you’ll remember the coldly poisonous voice of the relentless Lady Asaji, and Lord Washizu’s panicked glances from behind his fierce martial visage, the look of a trapped animal who sees no way to go except deeper into the trap. Yes, it’s very different from an uplifting action movie like The Seven Samurai in which heroic warriors fight desperately against the odds, but on its own terms, Throne of Blood is a very great film indeed. This is the belated sequel to The Three and Four Musketeers of 1973-74, those highlights of director Richard Lester’s career, an attempt to recapture the magic of those films with the same writer and largely the same cast as the originals. There have been scores of screen versions of The Three Musketeers, but Dumas’s sequel, Twenty Years After, is rarely filmed, mostly I think because its broad scope and wide-ranging plot aren’t easily shoe-horned into the feature film format. Reviews often refer to Return as a “loose” adaptation of the novel, but actually George MacDonald Fraser’s script is remarkably faithful to Dumas’s story. And that faithfulness is where it goes wrong, because trying to jam the whole book, plus new scenes featuring Cyrano de Bergerac (added, apparently, just because he could), into less than two hours was a big mistake. Fraser’s one of my literary heroes, but he’s blundered badly here; where his adaptation of The Three Musketeers unrolls across two movies and four hours at just the right pace for the material, Return is rushed and confused, and even has added (and awkward) voiceover narration by d’Artagnan here and there to try to explain what the hell is going on. That kind of desperate ploy in a movie is nearly always an admission of storytelling failure, and it doesn’t work at all well. The original films were a near-perfect balance of drama and comedy, of action and character scenes, tense where they needed to feel dangerous and loose when conveying the happy camaraderie of the heroes. Here the balance is off, leaning too heavily on slapstick, which often feels forced and just isn’t very funny. Reprising their rôles as d’Artagnan, Aramis, and Porthos, Michael York, Richard Chamberlain, and Frank Finlay all seem vaguely embarrassed at being involved in what amounts to tiresome self-parody. Even the usually unflappable Christopher Lee, returning as Rochefort, seems to be wondering what he’s doing in this thing. Only Oliver Reed plays his part with conviction, and as a result his Athos is the anchor to the whole picture. Reed is spot on, never lets up, and shows more stature and gravitas than the rest of the cast put together. The plot isn’t easily summarized; suffice to say it involves the musketeers in exploits in civil wars in both France and England, while they try to avoid falling prey to the vengeful assassination attempts of Justine de Winter (Kim Cattrall), the now-grown daughter of Milady, arch-villain of the original films. Athos’s adopted son Raoul (C. Thomas Howell) is thrown in to provide a love/hate interest for Justine, but he’s barely fleshed out, and is just as much a stuffed shirt here as he is in Dumas’s later novels. The less said about Howell’s acting the better, and while Cattrall is energetic, she doesn’t have a tenth the screen presence of Faye Dunaway as Milady. 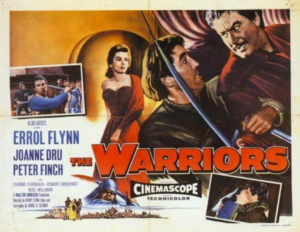 Even the swordplay is off: though the fights are arranged by the great Bill Hobbs, who did the original films (and is still working today, now on Game of Thrones), Lester seems to have lost the touch for desperate mayhem that served him so well in Robin and Marian and the first Musketeers films. Every once in a while there are flashes of his former greatness, as in the woodland encounter between Justine and Raoul, reminiscent of Ridley Scott’s work in The Duellists. And there’s one great character scene near the end where Athos and Aramis finally get the better of the wily Cardinal Mazarin (Philippe Noiret) and extort from him the musketeers’ long-overdue rewards. But mostly this movie will just make you want to go back and revisit those career-defining masterpieces whose magic it tries—and fails—to recapture.